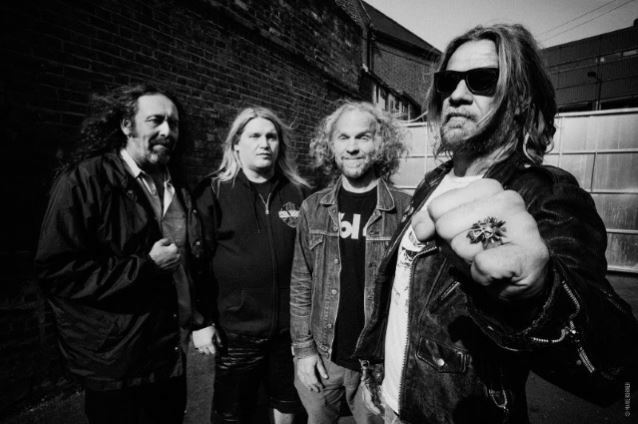 CORROSION OF CONFORMITY will release its new album, "No Cross No Crown", on January 12 via Nuclear Blast Entertainment. It will be made available on CD, digital, vinyl, and cassette formats. In 2014, after nearly a straight decade traversing the globe as a guitarist with New Orleans supergroup DOWN, Pepper Keenan reconnected with the core CORROSION OF CONFORMITY trio of Woody Weatherman, Mike Dean and Reed Mullin to hit the road hard. "Reed called me and mentioned maybe playing a couple shows," Keenan recalls. "I said, 'Let's just go to Europe and see if it works.' So we went to Europe and then ended up going back four times in one year... We toured for a year and then started tracking about ten or eleven months ago." Recording in North Carolina with longtime producer John Custer, CORROSION OF CONFORMITY cut "No Cross No Crown" in about forty days over the course of a year. "We took our time and didn't put any pressure on ourselves," Keenan says. "I'd go up from New Orleans and we'd do four or five days at a time, just hacking away at it. It was fun because we did it like a demo, but in a studio. We were writing and putting it on tape at the same time. We took what parts we thought were great from the old days and weren't scared to go backwards. It kinda wrote itself that way." Some of these new jams sound like could've easily been on "Wiseblood" or "Deliverance", two of CORROSION OF CONFORMITY's most revered records. On "No Cross No Crown", beefy Southern stompers like "The Luddite", "Little Man" and "Forgive Me" are interspersed with melancholy guitar interludes like "No Cross", "Matre's Diem" and "Sacred Isolation" — just like SABBATH used to do in the '70s. "We started doing that on 'Deliverance'," Keenan points out. "My theory on that is that if you're trying to make a record flow, you need to break it up a little. When you need a breather, write an interlude. I like writing those mellow pieces just to space things out and make the next thing come in heavier." The album's iconic title comes from a recent tour stop in England. "We were playing this old church from like the 1500s that had been turned into a performing arts center," Keenan recalls. "The dressing room had stained glass windows and one of them showed this poor fella being persecuted. Underneath it said, 'no cross no crown.' So I just took that idea. We're not trying to be on a soapbox, but we used it as a catalyst to write songs around." Which is to say that "No Cross No Crown" has a lot less to do with politics or religion than its title implies. "I think everyone needs to get away from that mindset in general," Keenan offers. "It just seems to be a mess out there nowadays. We need to get back to being humans and taking care of each other and simple things like that. For us, the terminology 'no cross no crown' is a theme. It's mentioned in like three songs throughout the album. We just weaved it through as we went." "No Cross No Crown" stands as irrefutable proof of CORROSION OF CONFORMITY's ability to overcome. "CORROSION OF CONFORMITY and the prior records I've done with them didn't just go away," Keenan observes. "It's an honor to be back out there and have an opportunity to do it again in a real way and not some washed-up reunion thing. Even before we wrote the record, we were out there for a year seeing there was a demand for it and that there was a void that we could fill. That's been CORROSION OF CONFORMITY's deal from day one. We're not chasing anybody around. We're not gonna worry about what the new trends are. CORROSION OF CONFORMITY is CORROSION OF CONFORMITY." Picked it up on my way to work and only got to track 6. The Luddite is the only that didn't really stand out to me so far. what do yall dumb gay elitists think of this record? probably not fruital enough. or underground.